My family and I were in the Baton Rouge area a few weekends ago to see the Avengers: Infinity War Movie. We had a great lunch at the Movie Tavern at the Juban Crossing. Before we returned home, we wanted a dessert for the road. 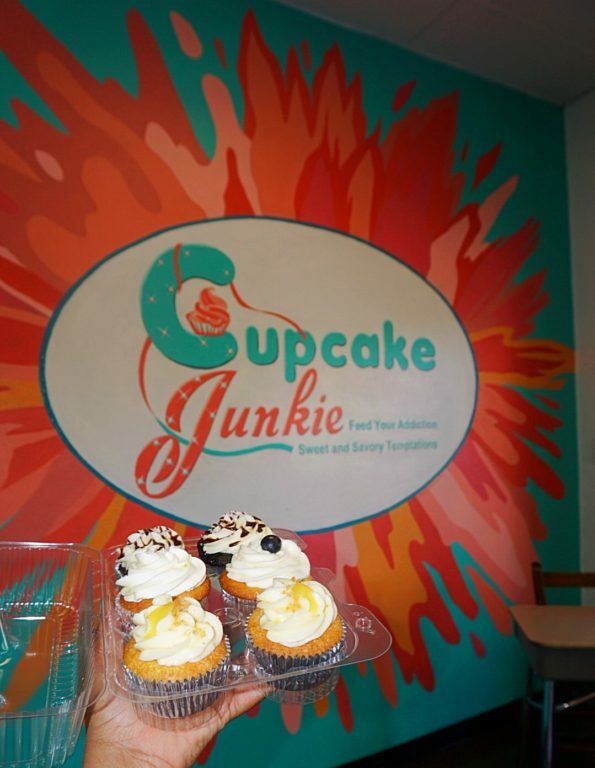 I remembered that I had never had the opportunity to try Cupcake Junkie’s spot. So we headed there to see if she had any items left. We were lucky and arrived at a good time because there was still some yummy treats available. 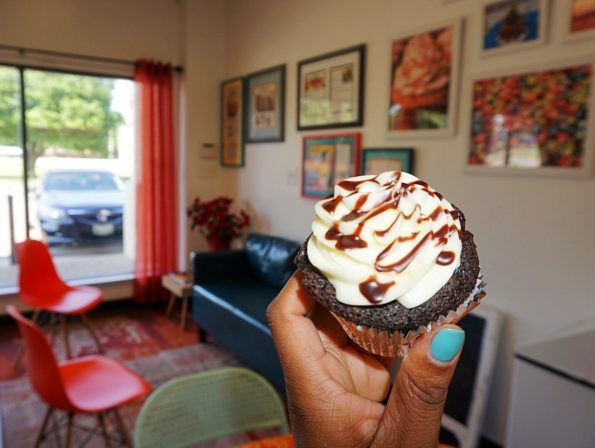 Cupcake Junkie is formerly an English teacher who turned her passion for baking into a business. Her dessert shop is cute. As I entered I immediately noticed the signature Cupcake Junkie wall that I have seen many photos posted by others of her yummy creations. I loved the seating area, the color scheme was creative and fun. A good spot to hang out with your girlfriends, the kiddos or with your crew. I was so excited to finally be able to try her desserts. Every time I am in the Baton Rouge area it seemed like I didn’t have time to stop by. But this Saturday was different. Anyone who knows me knows that I love desserts. I don’t indulge in desserts every day but I do love a good dessert occasionally. Cupcakes are my favorite dessert. I consider myself an expert when it comes to cupcakes and cakes on taste, style, and overall flavor of the cupcakes. I ordered 6 cupcakes to go for me and my family. We tried the Getaway, Lemon Meringue, the Danish and Blueberry Lemonade. The Lemon Blueberry was a lemon cupcake with fresh blueberries and iced with lemon cream cheese, and garnished with a fresh blueberry. A very good cupcake. The Lemon and blueberry pair together perfectly. The Getaway aka Vanilla made with a Vanilla cake, a vanilla buttercream and dusted with a vanilla-bean sugar. A simple cupcake, this one was my least favorite one. The cupcake was a bit dry and lacked flavor. For the kids, I ordered the Denial which was a Chocolate Cake topped with a vanilla buttercream icing and a chocolate ganache drizzle. This cupcake was superb. The kids loved this cupcake. A moist cupcake with a delicious buttercream icing and drizzled with chocolate ganache. 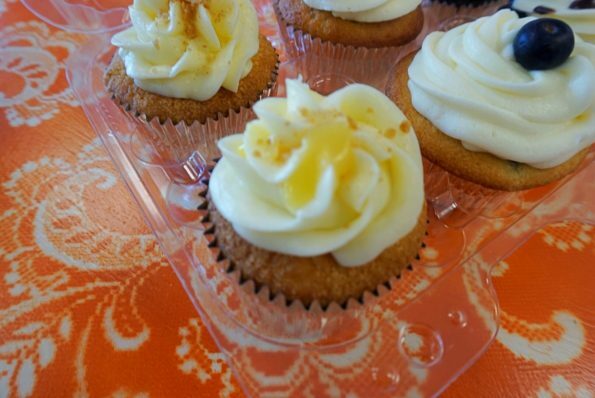 The Lemon Meringue Pie Cupcake. Oh my word!! This one was everything. A combination of a pie and a cupcake. I wasn’t expecting that crust at the bottom. This one was a winner in my book. Overall the Cupcakes were amazing. Probably some of the best cupcakes I’ve had in a long time. 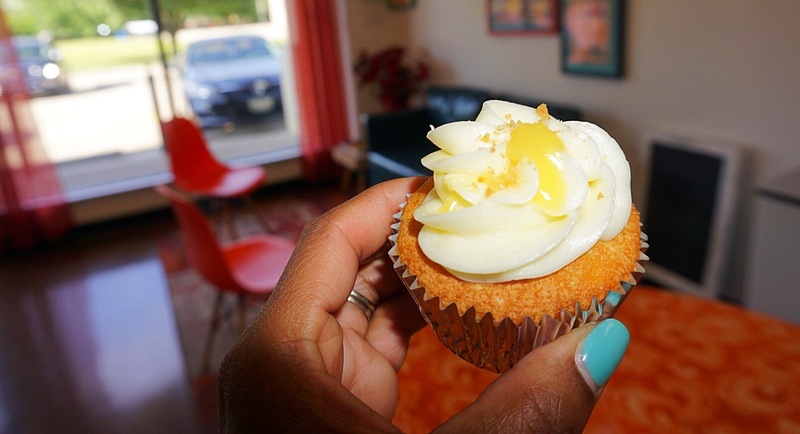 The Lemon Meringue cupcake was shockingly amazing and completely different. The crust base of the cupcake was impressive. My husband loves Lemon Meringue and he is very picky when it comes to cupcakes, it blew him away. The chocolate cupcakes were moist. I love that the icing wasn’t overly sweet. The kiddos loved these cupcakes. 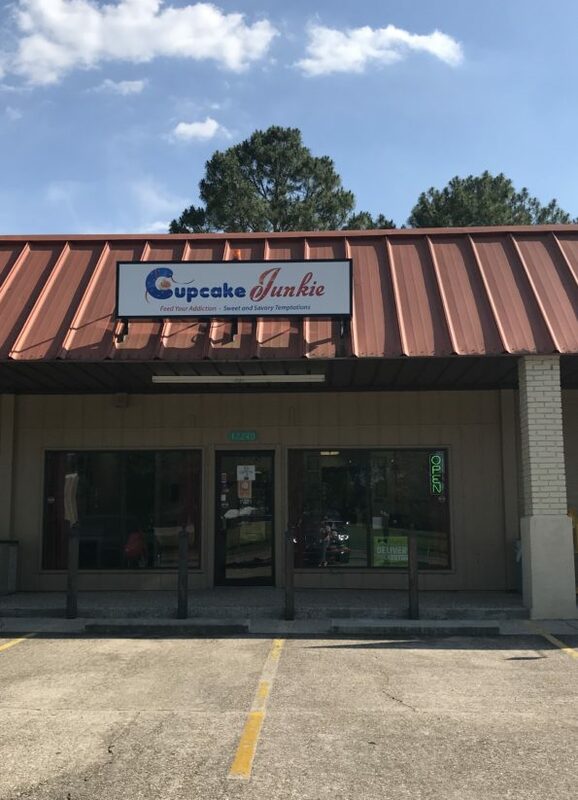 In addition to the items we tried, Cupcake Junkie also offers bundt cakes, cookies, her Signature Junkie Jars and Junkie Juice. I didn’t see any of the Junkie Juice the day I went but it sure sounds delicious. Don’t miss out on her plate lunches that she occasionally has. I hear the Red Beans are a hit. 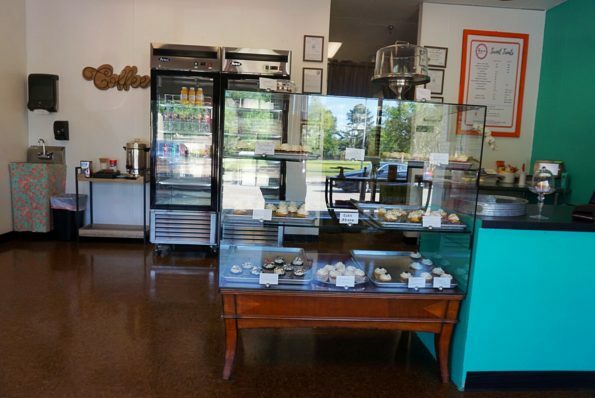 The cupcakes were well worth the wait. 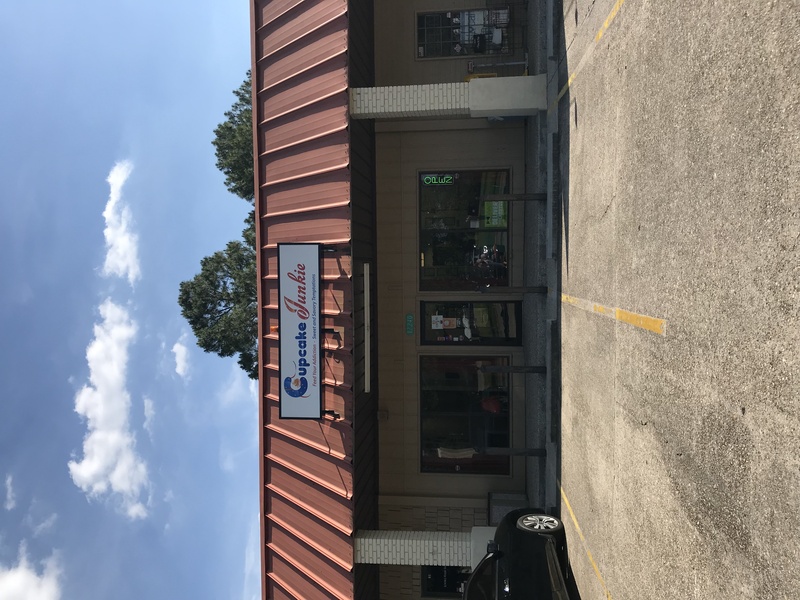 It took me a while to make my way to Cupcake Junkie but it won’t be my last time. The Maple Bacon sounds divine and I am hoping to try that one next time I return. I have some friends who share my love for Cupcakes and I will be sure to bring them along next time. 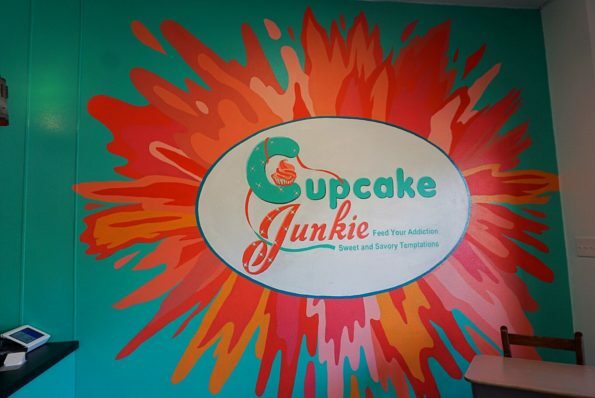 Cupcake Junkie is located at 12240 Courtesy Blvd. Baton Rouge, LA 70816. The Hours of operation are Tuesday – Saturday 11:00 a.m. – 6:00 pm. Go and check her out and be sure to tell her that Da’Stylish Foodie sent you!